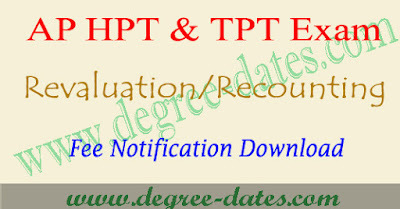 AP TPT/HPT exam revaluation/recounting fee last date & results :Andhra Pradesh director of govt exams has released AP TPT/HPT exam results 2017 for the batch 2015-2016.If any candidates not satisfied with results they are apply for revaluation.Here we are given AP TPT/HPT exam revaluation/recounting fee last date 2017 and fee structure , revaluation fee schedule and application form. The TPT/HPT Examinations, January - 2017 for 2015-16 batch candidates conducted from 20-01-2017 to 25-01-2017 in Andhra Pradesh State and the results are released herewith. Out of3734 candidates appeared for the Examinations, 3701 candidates have been passed. The Pass percentage is 99.11 %. The Memorandum of Marks are here by hosted in www.bseap.org web site for the convenience of the candidates 1 Colleges. The certificates will be dispatched to the Principals of the Institutions concerned in the State in due course. Further, it is also informed that the candidates may apply for Re-counting individually or through Institution concerned on are before 04-05-2017 by paying Rs. 5001- (Rupees Five Hundred only) per subject through Govt. Challan to the following Head of Account while enclosing the copy of down loaded marks memo immediately.